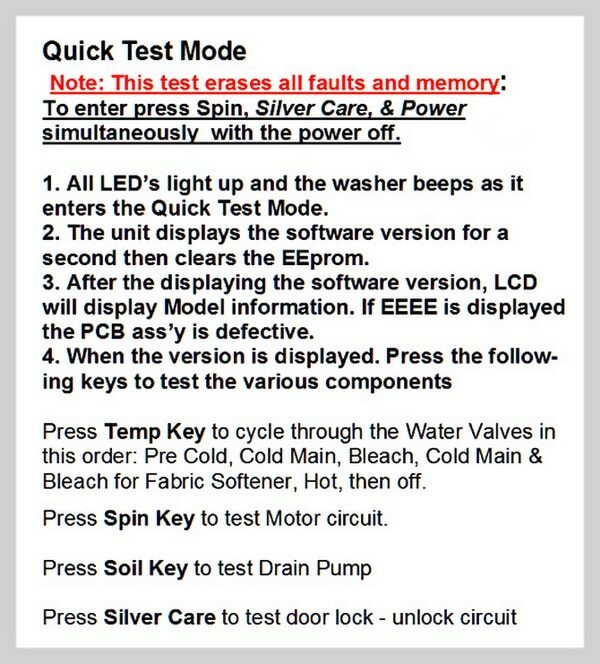 Samsung washer is showing 3e fault code message. My Samsung WF328AA Washer Does Not Spin at High Speed and Shows 3E Error Code. The washer spins at the normal speed but as it goes into the higher spin speed, the washer will constantly show error 3E on the display. I have tried unplugging the washer for 30 minutes but that did not help. I have tried to find a solution to the 3E error message but I cannot find anything specific to fix the 3e fault. 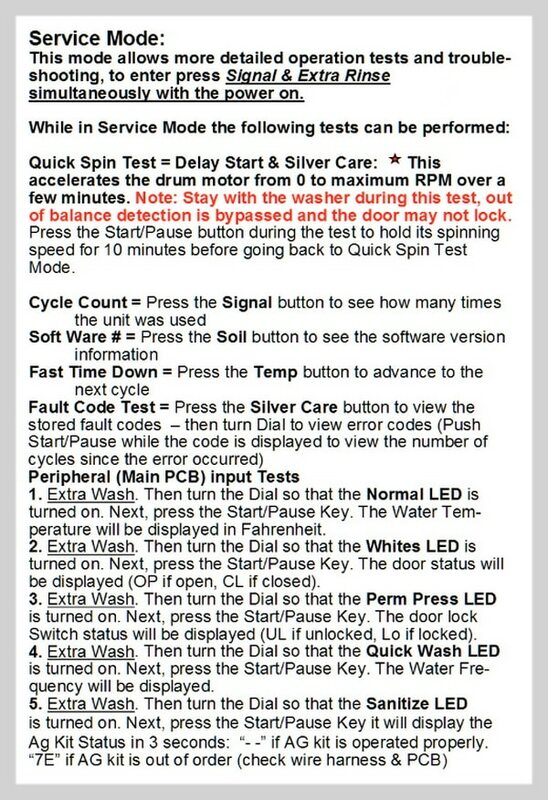 Does the 3e error code message mean there is an issue with the motor since the error appears when the washer goes into high spin? If not the motor, what other parts of the washer can I check myself to fix my Samsung washer? NOTE: Error 3E can also be caused by the wash drum being overloaded from too many clothes or a piece of clothing jammed between the drum. 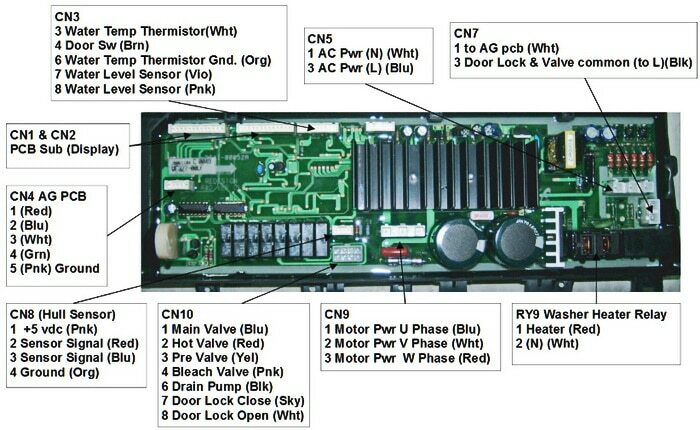 – Check the voltage going TO the hall sensor on the main control board on connector CN8 (see schematic below). 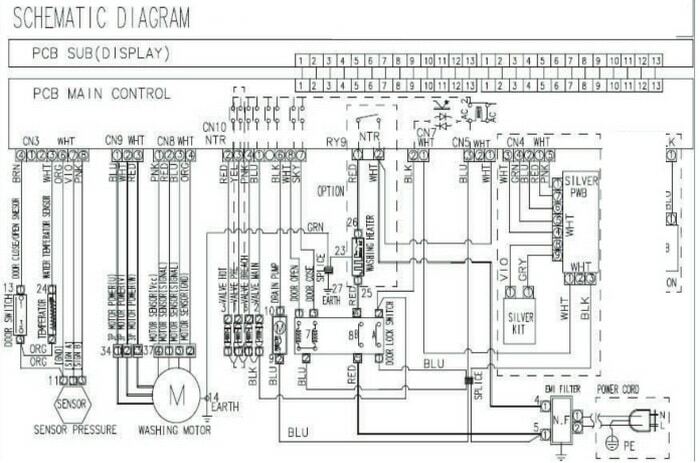 – Check the voltage going TO the motor on the main control board on connector CN9 (see schematic below). The CN9 connector has 3 different wires. With power OFF you will or SHOULD have 11.5 ohms between pins 1-2, pins 1-3, and pins 2-3 (see chart below). What is a Hall Sensor on a Samsung washing machine and what does it do? The Samsung washer motor has a sensor which is part of the system that determines if the drum is out of balance or spinning properly by the main PCB (control board). As the drum begins to spin, the MICOM on the control board looks for an indication if the motor is spinning and how fast it is spinning. The hall sensor measures rotation speed by reading the magnetic field created by the magnets on the rotor. If the Hall Sensor is not secure, is not electrically connected (loose wire), or not receiving voltage, the 3e error may show. 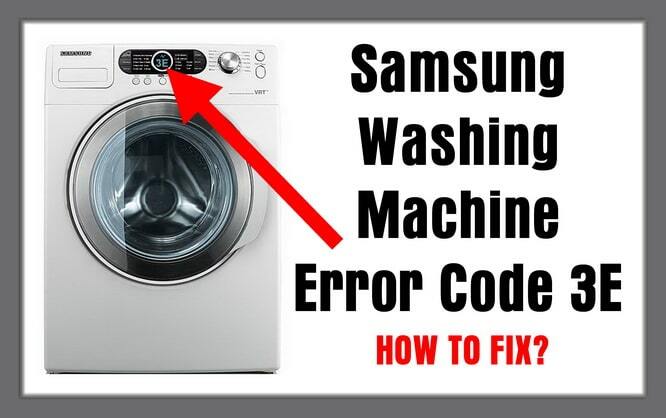 NOTE: This troubleshooting method for the 3e error code is meant for Samsung washing machine models WF328AAG/XAA, WF328AAR/XAA, WF328AAW/XAA, and other model number washers that are configured the same. If you have questions or problems with fixing and solving the 3E error code on your Samsung washer, please leave a question below with the model number and exact issue and we will be happy to assist you in troubleshooting the problem. Thanks for the support. I have a Samsung wf328aaw/Xaa washer. I performed all the tests for 3e error above. Checked connections, rebooted the board, multimeter test on hall sensor and motor. I didn’t find any problems. The bearings seem to be ok to. Drum spins well enough. My problem is intermittent. We will use washer and at spin cycle the 3e code will pop up. If we try to use washer immediately the 3e pops up again. If I shut the washer off, let it rest for 1/2 an hour I can get it to spin again through a spin cycle. Any ideas? New motor needed? Washer is about ten years old. Bearings? I’ve replaced the water pump already. Hi. I have error E3 code on my Samsung WF700n6w1. It doesn’t spin. We can’t even access the motor as there’s no back panel you can remove, the 3 side walls are all one block. It was never designed to be easily repaired! Still, anything I can do? I can see the belt is still on, but that’s it. Thanks. Ultimately we did 3 loads with the new motherboard and got a 3e code and of course tried to choose the “spin only” cycle and it didn’t do anything. I think it doesn’t know what the spin only cycle IS… what’s my next step? Have the above error code checked all wiring, motor but the washer still wont spin. Next post: How To Delete An App On A Sony Bravia Android TV?